Ocean modelisation – Fourier – Render me a Pangolin ! Render me a Pangolin ! 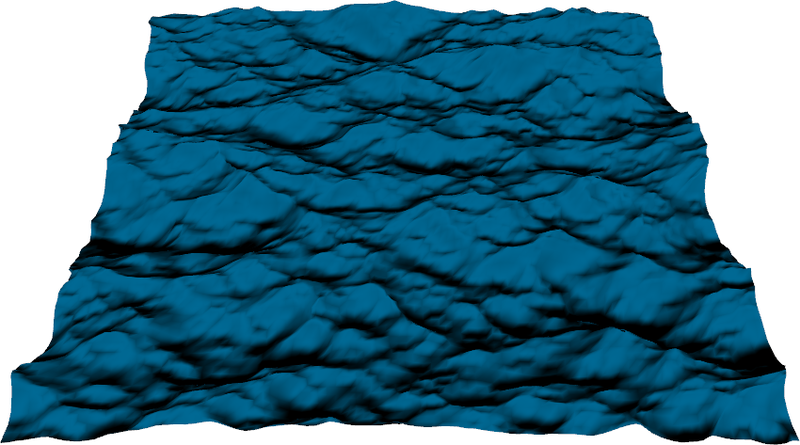 Modeling ocean waves can be a difficult task. Waves are generated from the interaction between the wind and the ocean surface and this interaction is usually overly simplified during modelisation. There are two main classes of solution to generate waves, either using the Fourier spectra of the ocean , or representing the waves as a sum of trochoids . Modeling terrains using Fourier is quite known. You get the Fouier Transform of a white noise (so that all frequencies appear), you filter it to select a subset of those frequencies and you use the inverse Fourier Transform on this subset. This gives you a heightmap representing your terrain ( http://paulbourke.net/fractals/noise/ — Article on « Frequency synthesis of Landscapes (and clouds) » ). The same process can be applied to the oceans. When modeling the ocean using a Fourier spectra, the idea is to represent a set of waves as a sum of sinusoids with different frequencies. The trick is therefore to choose those frequencies carefully. Oceanographic research have actually an answer to this as several spectrum where defined to represent the frequency of waves. By applying a Fourier transform on a subset of those frequency, you can get an heightmap representing a very realistic ocean. Here, we will used the formulas given by . Those formulas and the corresponding code are already very well explained in the tutorial by Keith Lantz (http://www.keithlantz.net/2011/10/ocean-simulation-part-one-using-the-discrete-fourier-transform/) but i’ll reexplain it anyway. The idea is to disturb a grid mesh of M*N points. where h(x, t) is the height for a point x of coordinates (x, y, z) at a time t. k are the frequencies of the complex exponentials and h~ is the Fourier Transform of h. Since we need as many frequencies as the number of points, we put k = ( (2πn / Lx ), (2πm / Lz) ) with n in [-N/2, N/2] and m in [-M/2, M/2]. with ω(k)² = gk, g being the gravitational constant and k being the length of the vector k. This leaves the question of evaluating the complex number h0~, h0~* being its conjugate. Expressing h~ as a sum allows to maintain the complex conjugation property, h~(k, t) = h~*(-k, t). where L = V²/g; V being the windspeed and w being the direction of the wind. The ^ symbol means that the vectors are normalized. A is a constant (0.0001 in our examples). with l = 0.001 * L. This removes the waves too small to be seen. where ξ are independent draws from a gaussian random number generator. Careful, h0 must be evaluated once at the initialisation of the ocean. Otherwise, at each time t, h will be evaluated from a different h~, and therefore will represent a different ocean. We also have the following formula to compute the surface slopes. 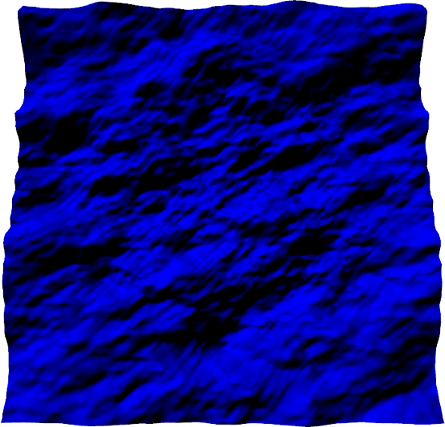 From there, we can code a heightmap generator to build our ocean. Ocean heightmap. Grid of size 100×100. Computed in 77 seconds. The ocean surface is not a heightmap ! Therefore, Tessendorf presents the Choppy Waves algorithm. 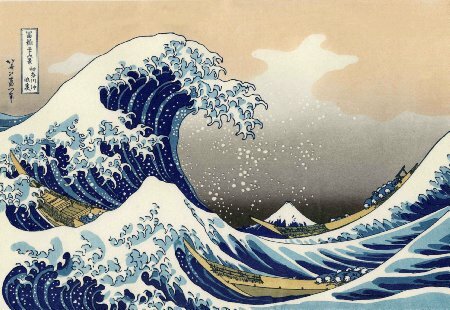 If it does not allow to create plunging waves as illustrated, it allow to creates sharp waves. This is very similar to Gerstner waves. Every point of the grid mesh is displaced on x and z to compress or dilate parts of the mesh; simply by adding D(x, t) to the x and z coordinates of the wave. This creates peak waves. Displaced grid ocean. Peak waves appear in the middle. Using a discrete Fourier Transform, we have the following code. However, as given in the caption of the pictures, computing the surface is very slow. This can be improved by using a Fast Fourier Transform, but this will be another story ! A small optimisation that can divide almost by 2 the computation times. For each h0~ that is computed, only part of them will impact strongly the final surface as some of them will lead to waves with amplitudes too small to be seen. What can be done in the initialisation therefore is to test the values of the h0~ and to keep only those above a thresold. Then, when computing h~, the sum will be done on much less k and will therefore run faster. A. Fournier and W. T. Reeves, “A simple model of ocean waves,” in ACM Siggraph Computer Graphics, 1986, vol. 20, pp. 75–84. G. A. Mastin, P. A. Watterberg, and J. F. Mareda, “Fourier synthesis of ocean scenes,” Computer Graphics and Applications, IEEE, vol. 7, no. 3, pp. 16–23, 1987. J. Tessendorf and others, “Simulating ocean water,” Simulating Nature: Realistic and Interactive Techniques. SIGGRAPH, vol. 1, 2001.